URI crosses 150 crore - Highest Mid-Budget Bollywood Grosser. URI The Surgical Strike crosses the 150 Crore mark and it is a humongous blockbuster. In terms of numbers, the Vicky Kaushal film is the second highest grosser (not adjusted for inflation) among films released in January behind the monumental blockbuster Padmaavat. Among the mid-budget films, the film has become the highest grosser ever beating Tanu Weds Manu in 17 days at the box office. The film is a definite 175 crore plus grosser. The trend in the fourth week will decide if it has any shot at 200 crore or not. The film has managed to collect good numbers despite competition from Manikarnika and Thackeray. 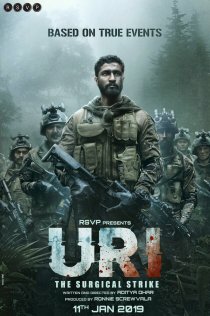 For films made on a budget of less than 50 crore, URI is now the biggest yardstick in terms of box office numbers as the film has blow out of the roof in terms of box office trend and appreciation from the audience. It won't be wrong to say the numbers of URI might remain on top in the first quarter of the year. The possible challengers to these numbers are Kesari, Kalank and Avengers : Endgame with the latter two being movies which will release in next quarter (April).